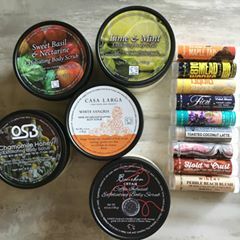 Cire d'Abeille Skin Care is a brand of artisan-crafted products made here in the Rochester area in Fairport, New York. Cire d'Abeille is local and I felt an instant connection right off the bat. This line is stellar and I want to share it with every single person I know. Although it has been YEARS since I had my facial care line and life has taken me in other directions business-wise and passion-wise, I know how hard it can be to get a solid skin care brand off the ground. I also know first hand that it takes an extraordinary amount of time and effort to get those products Leaping Bunny certified cruelty free. So I give this brand kudos for her dedication. I am impressed. I am not just impressed by Ashley's passion for being cruelty free or because she is local. I am truly impressed by the products themselves! I am very fortunate to be able to try out beauty products in all price ranges for this blog and for my print work, as I am introduced to so many products I may otherwise never have encountered. Many of these products are very good. Rarely, others stand above the pack and I want to scream from the rooftops about them. That is how I would describe Cire d'Abeille. Cire d'Abeille Skin Care is owned by Ashley Monney. As I mentioned earlier, her cruelty-free, paraben free products are handmade in small batches right here in upstate New York. 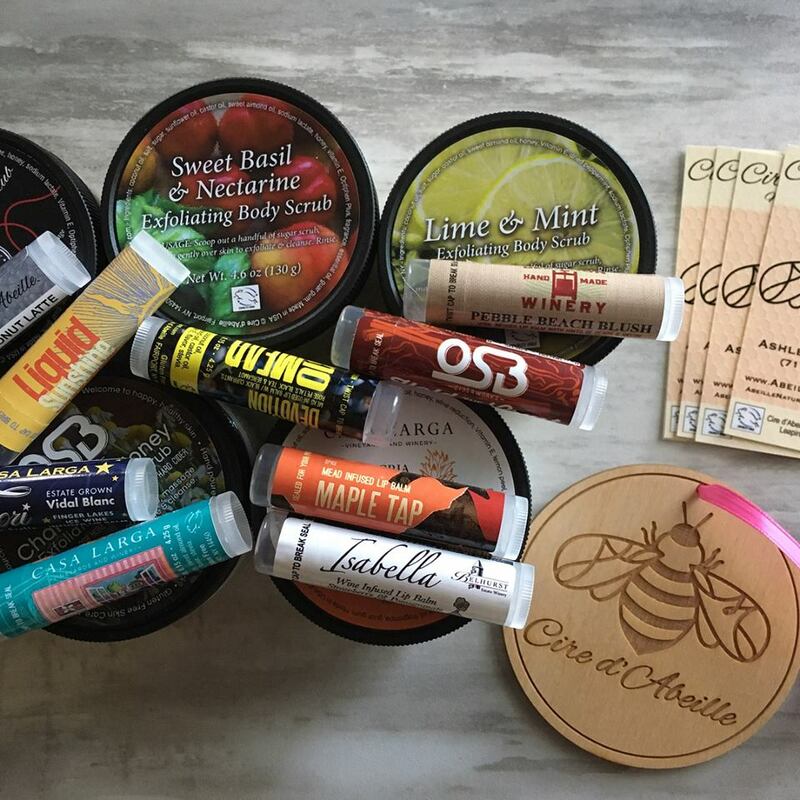 From body scrubs to lip balms, you're sure to be impressed with anything you try! I have tried over a dozen items from this local company and I can say that Ashley's creations are little slices of heaven. 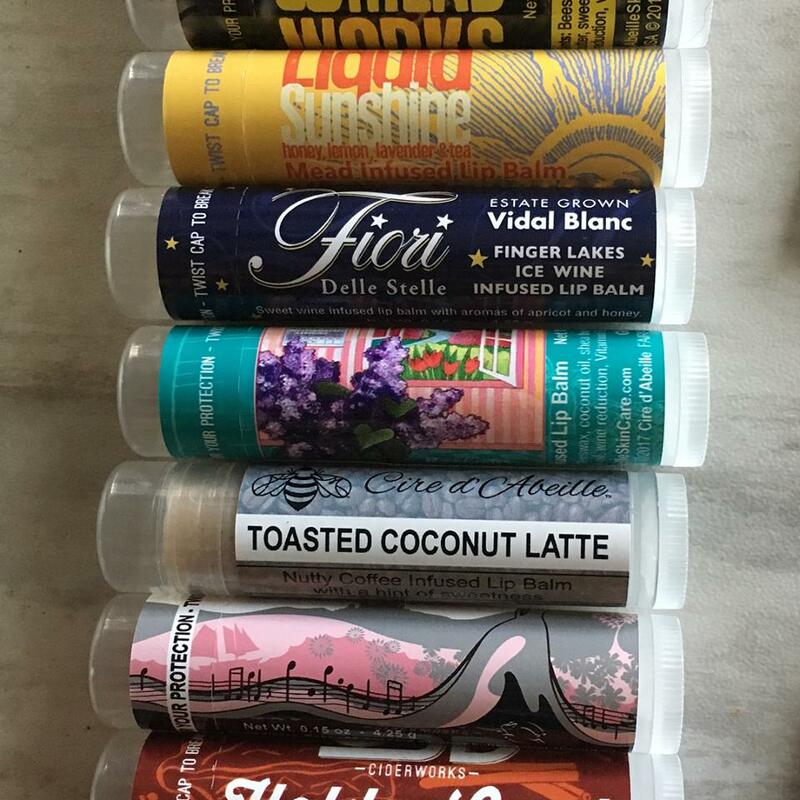 Each lip balm is unique and delightful. The body scrubs are exquisite - perfection in jars. Intoxicatingly scrumptious body care products like Black Button Distilling Bespoke Boubon Cream Coffee Infused Body Scrub are comforting and smell like heaven, as is The Waffle Factory Salted Caramel Latte Body Scrub. I was so excited to see the latter on the counter the other day when I had a group of four 12 year olds out for waffles. I just had to buy it! The Lime & Mint Exfoliating Body Scrub? Hello, can you say mojito?! Like every single Cire d/Abeille product I have tried, this one smells so fresh and truly unique, blended exquisitely -- expertly. And friends, the Toasted Coconut Latte lip balm is the BEST lip balm on earth -- no joke -- and I have tried hundreds in the past ten years of blogging. It contains coconut oil, shea butter, coffee infused sweet almond oil, carrot seed oil, and more. It is moisturizing, non-sticky and tastes amazing. Truth be told, ALL of the lip balms are total perfection. Next up on my "to try" list: The Waffle Factory Banella Lip Balm. What is Banella, you ask? It is a banana, chocolate, and hazelnut cream lip balm. Delicious. Could this be the planet's best scrub? How do the scrubs from Cire d'Abeille stack up? It is true. I am super picky about scrubs -- not to be difficult, but because I absolutely love body scrubs and am a touch critic. I have three brands of scrubs that I absolutely adore: Clover and Bee, Lemongrass Spa, and Rachel's Plan Bee. They all have their strengths. They all have left me sad when I use my last scoop. All have very good ingredients. Because of these factors, I want to break down cost since I have recommended them all to you over the years. The Bottom Line: Cire d'Abeille Skin Care has the BEST body scrub. It is no contest. When you look at ingredients, packaging, how the product FEELS and WORKS, I prefer this brand to the others. The price cannot be beat when it comes to high-end caliber body exfoliants at a very affordable cost. Of the 4 brands, this checks everything off the list of what you are looking for in a body scrub. 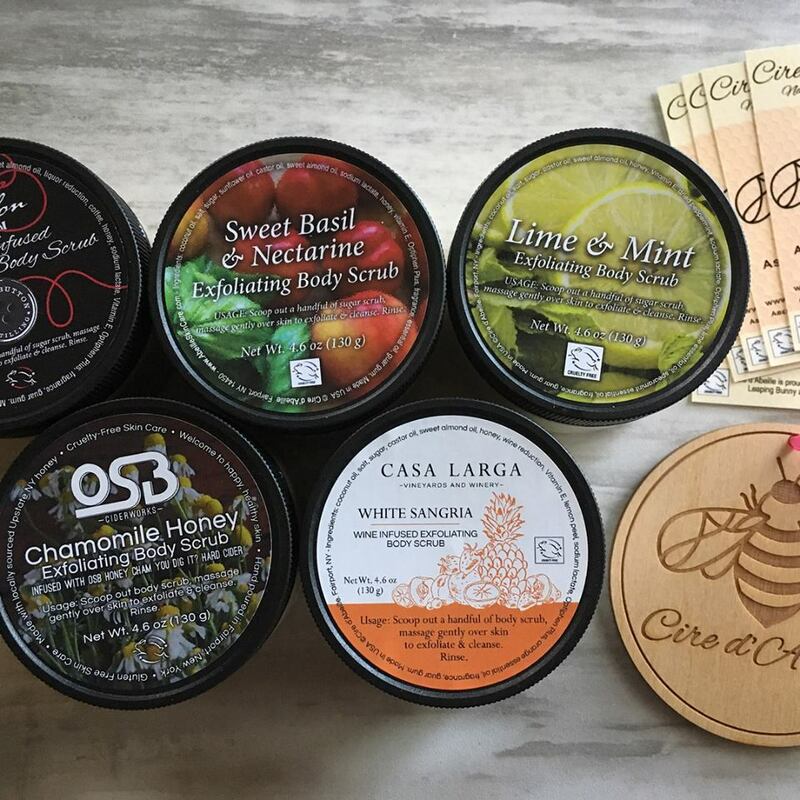 One last point: I feel really good about using these products, not just because of the fact that they work well and make me feel pampered and special, but because supporting Cire d'Abeille helps support our local economy. You see, Ashley could buy the largest economy size can of coffee to make her scrubs with coffee in them. She doesn't. She uses Union Place Coffee Roasters coffee, which is in Rochester. Her wine-infused products could me made with a big cheap box of wine. Instead, she supports local businesses such as Deer Run Winery and Casa Larga. These are just a couple of the MANY businesses Cire d'Abeille partners with to create such unique products. When you support your fellow local small business owners, you are not only helping your local economy, you're also making deposits in the karma department (in my eyes, anyway)! I really wanted to tell you all about Cire d'Abeille much sooner, but I did not want to hurry with the post because this brand is really something special. Do yourself --and your skin -- a favor and head over to the Cire d'Abeille website, Facebook page, and Instagram account.